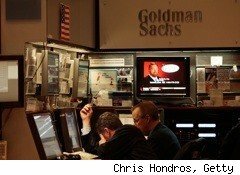 Goldman Sachs Group (GS) promoted a record number of employees to the position of managing director, giving them more money and prestige as the bank rebounds from the financial crisis. The bank raised 321 people to the status of MD, up from 272 last year, Bloomberg News reported. Earlier this week, the company selected 110 people to become partners, giving them access to a special compensation pool. Since CEO Lloyd Blankfein took over in mid-2006, Goldman Sachs has increased its total workforce to more than 35,000 from about 24,000. Promoting people this year is a sign the company wants reward people who stayed and weathered the financial crisis, according to Charles Peabody, an analyst at Portales Partners LLC. "It's a function of trying to regain loyalty after turbulent times," Peabody told Bloomberg News. Managing directors are a single notch below the highest rank of partner.